Last night I attended the Roy & Lea Black Gala at the Fontainbleau Hotel. The event was spectacular with great performers like Paulina Rubio and Natalie Cole. Just as I was leaving for the gala it started to rain. The rain stopped just in time for me to make it to the Gala on time (I biked there) and there was a beautiful rainbow over South Beach. 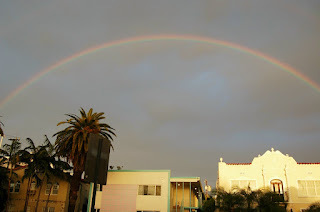 I took lots of photos of celebrities at the Gala but none as memorable as the rainbow shot.